The 2009 seminary graduation day was a very festive and special occasion in the CLCI. By the wonderful grace of our Lord and Savior Jesus Christ, the climax has come for the 11th batch of graduates from the CLCI seminary. We call these ceremonies as “commencement exercises,” because Graduation is not the end; it’s the beginning. As usually, we have extended an open invitation to our CLCI congregations. Even though there were a few showers in the afternoon, the Lord gave us wonderful atmosphere in the evening time. A beautiful dais was set, and the whole campus is made to look like spring. Instant colored lights and decorations are arranged all over the campus. Our 11th graduation ceremony was an event with wonderful sermons from chief guests Rev. Koenig and Rev. Matt and valuable advice from the commencement speaker Rev. Benjamin to the graduates. All the graduates dressed with neat clothes and ties. This years’ CLCI graduation is really a wonderful time as we see the fruits of our labor, our graduates, going out into the world to fulfill their calling. The Graduation ceremony was started at 6.00 p.m. Singers from different CLCI churches presented some melodious Hymns and Christian songs. Sunday school children gave special grogram with action songs, songs of praise and welcoming all the guests, pastors, members and the graduates to the ceremony. Rev. V.S. Benjamin gave the commencement address. He greeted everyone in the name of the Lord Jesus Christ and spoken briefly on the responsibilities of the pastors. Finally he congratulated the graduates and repeated his warning to graduates about their new phase of life to keep it pure. The wonderful and special messages from honorable Missionaries Rev. David Koenig and Rev. Matthew Ude will go a long way in encouraging the graduates. As per the schedule, all the graduates left their seats one by one and walked up to the stage to receive blessings and individual prayers from the CLCI leaders and honorable missionaries. 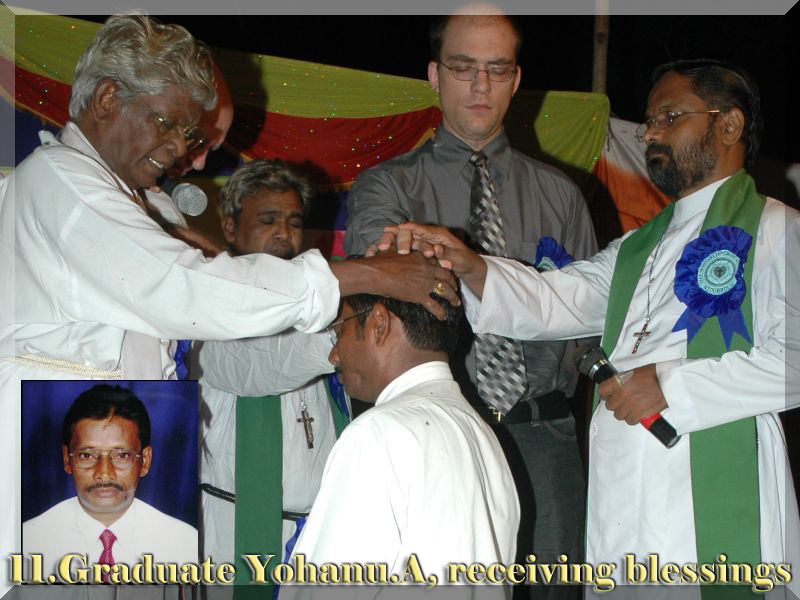 As one by one the graduates knelt for blessing, Rev. V.S, honorable missionaries, seminary principal and lecturers pronounced a blessing with prayer and laying hands on each graduate. Seminary professor Pastor Isaiah and Pastor Nireekshana conveyed their greeting to the graduates. Due to the lack of time, only two Graduates gave their testimonies regarding their three years training experience they have received in the CLCI Bible Institute. They specially thanked the Principal that they will never forget his help in their life. They have more than a diploma they can hang with pride on wall. They have something more than that; they have the opportunity to literally change the course of history by bringing the Word of God to bear on all the people. As Principal of the seminary, in my closing words, I congratulated the graduated students and conveyed my best wishes and blessings. As principal of the seminary, I do miss these graduates. In all these years, it was a joy for me to experience their passion, intelligence, curiosity, frustration, honesty, doubts, and hopefulness on a daily basis. I miss that. All of them became my good friends. It’s an amazing thing to see them, now, spilling out into the church as leaders and pastors and teachers. I encouraged all the graduates to be faithful in proclaiming the good news despite of apathy or opposition. These following 12 men are being honored this year with diplomas: 1. Bhaskarao Kocherala, 2. David Raju Kotha, 3. Divakar Chinthala, 4. George Polumatla, 5. Samsonu Chukka, 6. Samuel Wesley Machavarapu, 7. Sleevaiah Penumala, 8. Susheelarao Dasar,i 9. Vandanam Srirama, 10. Yakobu Sasthri Gollamoodi, 11. Yohanu Aramalla, 12. Yohanu Gandham. May the Lord continually bless these 12 young men as they go into the field of the Gospel as shepherds, to spread the Word of God to the sheep. Immediately following the graduation ceremony, all the members, pastors, students, children and friends were invited to a love feast on the CLCI campus to honor the graduates. The CLCI campus totally filled to capacity. More than 950 members attended the graduation ceremony and everybody enjoyed the special dinner. Dear brothers, we thank the Lord for His wonderful grace on this Graduation ceremony of 2009. We once again thank and praise God for the wonderful assistance we have been receiving from the respected CLC Mission Board, Kinship Committee, Missionaries, CLC visitors and volunteers. Especially we thank all those individual CLC sponsors there in USA who have been praying and helping the seminary students. We are honored and glad to inform you that in the midst of this eleven-year period, 69 fully trained pastors came out of this CLCI seminary and all of them have been rendering their valuable services in various CLCI congregations. Now the Seminary students are enjoying their new educational year 2009-10. At present there are 38 students in the seminary. Now 12 students are there in the final year, 14 students are there in the second year and 12 students are there in the first year. Please remember them in your daily prayers. Please pray that more young people will be challenged to take up the call to the ministry. It has been an absolutely rewarding ministry. Before closing this report on graduation, I would like to quote a verse form Hebrews 6:10, “For God is not unjust to forget your work and labor of love which, you have shown toward His name, in that you have ministered to the saints, and do minister.”Accordingly, the Lord will bless you all abundantly. For this we have been praying everyday with thankful hearts.